Soil represents one of the fundamental elements of viticulture. It is not by chance, in fact, grape varieties to be planted in a vineyard, and – in particular – their rootstock, are chosen in function of this factor. It is commonly known that, after the devastation of phylloxera – which brought up concrete risks for viticulture in Europe – all the grape varieties are grafted to a rootstock capable of resisting to the attack of this aphid. This also allowed varieties to adapt to different environmental conditions, by significantly interacting with the capability of the vine in absorbing minerals and nutrients, as well as ensuring a good supply of water. This factor, in addition to the geological characteristics of the soil, allows the vine to generate different expressions, sometimes even distant, however according to soil and environment. To the soil is recognized, frequently and mistakenly, the capacity of giving the wine organoleptic qualities which are generally defined as mineral. The concept of minerality in wine, although this is well defined and perceivable to the senses of a taster, has no concrete and scientific explanation which can clear the origin of this sensation. Before defining, at a sensorial level, what is minerality in wine, let’s try to clear the reason why it has no connection with the soil in which a vine is cultivated. It should however be noticed the sensation of minerality is sometimes perceived in wines produced from grapes of vineyards cultivated in particular soils, such as volcanic soils, for example. If for “mineral” we consider a sensation produced by a mineral salt or elements, and supposing they are absorbed from the soil by the vine and reach berries, it should be noticed the quantity contained in grape juice is pretty negligible. The concept of minerality in wine is generally defined by the olfactory sensations associated to some stones and minerals – such as flint – as well as some metals. Some support the idea minerals and metals do not have a proper smell, indeed this theory can be easily denied by facts, for example by the smell produced by scratching flints. Also stones heated by the sun, or wet by water, generate their characteristic smell. Finally, some tasters classify as mineral the aromas of sulphur, tar, smoke and burnt rubber, sensation we believe should be classified differently. Some also believe minerality is associated to the gustatory sensation of salinity, typical in certain wines produced from vineyards cultivated along the sea or however affected by the strong influence of sea breeze. It must be noticed the salty sensation produced by certain wines – and of disputable association to the concept of minerality – does not correspond, as believed by some, to the sapidity of wine. The term minerality, referred to wine tasting, is however associated to many olfactory and gustatory stimuli, frequently of purely subjective attribution, and get different and subjective meaning also among wine tasters. For some, minerality is associated to the crispness of a wine, for others it corresponds to wine’s finesse, other, finally, associate minerality to the so called taste of terroir, that is the overall organoleptic sensations expressed by a wine of a specific territory. Science does not help to explain the concept of “minerality”, as there are no tangible proofs about the relation of wine components and the perception of this sensation. It should however be noticed the most reliable scientific hypothesis supports the idea minerality is produced by some sulfur compounds in their reduced form and developing according to variety and aging. If it is true minerality has no connection with the soil and the qualities this can give the wine, it is however undeniable its composition affects organoleptic characteristics, from appearance to taste. It is not the only factor capable of giving wine its personality and its peculiar characteristics, it however represents one of the fundamental factors. Not all the soils are the same, not all grape varieties are the same. There are grapes making better wines in specific type of soils, whereas in others the make, not only ordinary results, but also disappointing wines. 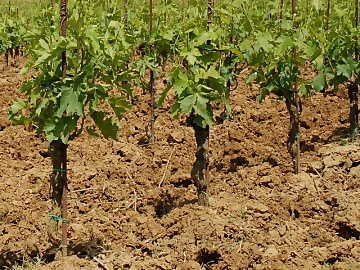 The variability of the result, besides the conditions of the soil and environment, are strongly conditioned by vine’s rootstock which – like already said – it is chosen also according to the composition of soil. The composition of soil, as well as environmental and climate conditions, directly affects the organoleptic qualities of wine and interacts with the biologic cycle of vine. The influence of soil in wine affects all of its sensorial aspects. Wine appearance and its color, as well as the development of certain aromas and specific gustatory qualities, have a direct connection with the characteristics of soil. We will in fact see later, every type of soil – having proper geological characteristics – substantially affects the wine which can be obtained from the same variety, producing, in most of the cases, results even distant one from each other. By considering the specific types of soil and their effects on wine, it should be noticed the result is also in function of vine’s rootstock. The same vine, grafted to different rootstocks, in fact gives different wines also when planted in the same soil and in the same vineyard. We will not discuss about the agronomic effects and consequences of the soil in vine cultivation, although we will discuss some fundamental elements, we will mainly talk about the influence of soil in wine’s organoleptic qualities. From an agronomic point of view, soil is the fundamental support of a vine, in which the plant sets it roots, in order to ensure a proper support as well as for the supply of nutrients, mineral and water. Like already said, mineral substances absorbed by the vine from the soil – which some believe to be responsible for the minerality of a wine – do not have a connection with this organoleptic descriptor. If it is true part of the mineral elements absorbed from the soil reaches berries, and therefore the juice, the quantity found in wine is quite negligible to the sensorial perception. Vintners usually say vine, in order to give a quality wine, must suffer, that is it must be favored a condition in which it is forced to dig the roots in the deep of the soil in order to search for water and nutrients. This hypothesis has a concrete foundation, as wines produced in vineyards cultivated in very fertile soils have light organoleptic qualities, from appearance to taste. Vintners are always contrary to the irrigation of vine, except when drought is a serious concern and could be a risk for vine’s life, in order to “force” the vine to search for water in the deep of soil. On this regard it should be noticed DOC and DOCG production disciplinary of Italy expressly forbid the irrigation of vineyards. This is mainly forbidden in order to avoid a quantitative production of grapes, a factor that, unavoidably, is detrimental to wine quality. A soil suited to viticulture should have, among its main qualities, a good draining of water. Not only for the fact this forces the vine to search for water in the deep of the soil, but also for the fact it avoids roots to stay wet for a long time. We will not discuss about the physical and geological aspects of soil composition, however it should be noticed it is essentially made from skeleton, sand, clay and silt. Skeleton is made from elements of big size and having a scarce agronomic effects. Sand, clay and silt are made from very small particles and play important agronomic roles, both in terms of draining and absorption of water, as well as for soil porosity and its fertile characteristics. Types of soil differentiates one from each other by the variable presence of these elements, giving each of them proper agronomic and physical properties which will affect cultivation, yield and quality of vine and grapes. Clay is the most frequently found element in soil composition, also in terms of quantity. It has the property of absorbing water and of keeping organic substances, therefore making the soil pretty fertile. Grapes cultivated in soils rich in clay, give tannic wines, with intense color and low transparency, with good possibilities of long aging, pretty high content in alcohol, remarkable structure, good aromas and roundness. Lands rich in sand give the soil remarkable draining properties. Wines produced from grapes cultivated in this type of soil are characterized by pale colors and high transparency, good crispness, short potentials of aging, generally having a good elegance and fragrance of aromas, light body. In any case, excessively wet soils give wines with a pale color, lack of aromas and structure, short longevity and accentuated crispness. The same qualities, like already said, are found in wines produced in very fertile soils. Soil is not made by clay, silt and sand only. Also skeleton, therefore elements having a bigger size, interacts with the biological cycle of the vine and give wines specific qualities. Soils rich is schist, gravel, marl and slate, offer a good heat retention and reflect sun rays upwards. These characteristics are therefore useful to late ripening varieties, such as Cabernet Sauvignon, and favor the development of fruit and flower aromas. A soil rich in chalk – a classic example is the one in Champagne – reflects sun rays upwards to the vine, it is very soft and therefore roots can easily dig in the deep of soil. Moreover, chalk gives grapes a pretty evident acidity, an important quality for the production of sparkling wines. Other important elements of the soil are limestone and calcium carbonate. These elements generally give the wine intense aromatic qualities, with fine and elegant aromas, a moderate acidity and they are not always suited for a long aging. An excessively acidic soil makes wine with pale colors and the aromatic profile usually develops quite ordinary aromas, whereas to the taste it has a good crispness, as well as a lack of body and alcohol. The diversity of soil composition – therefore varying the presence of skeleton, clay, silt and sand – directly affects the organoleptic qualities of wine, appearance, smell and taste. Soil is integral and essential part of the terroir concept and, associated to all of the other characteristics making the environment and climate, allow the making of unique wines, unrepeatable elsewhere. Finally, the intervention of man can frequently change this balance. Soil can in fact be altered by changing its composition and, with that, the wine which can be obtained. welcome to my world!!! Βότανα, συμπληρώματα διατροφής, μπαχάρια, χειροποίητα δώρα, φυσικές συνταγές, βιβλία και φαντασία! !καλή απόλαυση!!! ...and some of them actually happened.